If you love Vera Bradley or need a great gift, today is the day to STOCK UP. 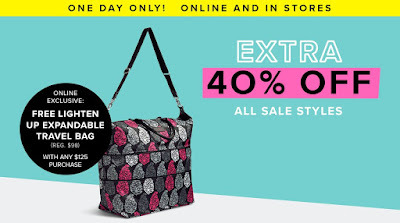 Today only, Vera Bradley is offering an ADDITIONAL 40% off Sale Styles with prices starting at just $1.68. These are some of the lowest prices I have ever seen so be sure to grab yours now before everything sells out. The best part is, ALL ITEMS SHIP FREE. Plus, get a FREE Lighten Up Expandable Travel Bag with any $125 purchase (Reg. $98). I am stocking up on teacher gifts, Christmas and my gift closet.